Successfully Added THL T9 Plus Android Smartphone - 4G, Dual IMEI, Android 6.0, 5.5-Inch Display, 3000mAh, Quad-Core CPU, 2GB RAM (White) to your Shopping Cart. Say hello to the THL T9 Android smartphone – a remarkable Chinese smartphone that does not only feature a beautiful design but also holds some serious hardware within. With its Android 6.0 operating system, this Android phone delivers a powerful performance through which it treats you with an exceptionally smooth and fast user experience. Supporting all the latest features Android users are familiar with, this Chinese smartphone is sure to meet the liking of all smartphone users out there. Its 3000mAh removable battery further increases your overall user experience by providing you with a stunning 10 hours of continuous usage time – letting you take the absolute most out of this Android phone and all it has to offer. With its Quad-Core CPU that has been clocked at 1.3Gz, the THL T9 smartphone is capable of handling the most demanding of games and applications without dropping a frame. Along with its powerful CPU comes 2GB of RAM, turning this Chinese smartphone into a true power horse that effortlessly deals with excessive multitasking sessions without ever slowing down your device. Whether you like to play games, watch movies, browse the web, or simply enjoy the latest mobile applications – this Android phone allows you to enjoy them all on its beautiful 5.5-Inch HD Display. Supporting 720p resolution, this Chinese smartphone portraits high detail and vivid colors through which it assures that you’ll always be able to take the most out of your mobile entertainment experience. Packing 16GB of internal storage and supporting 128GB of memory externally, the THL T9 comes with oceans of space for you to store all your media and files alike. With its state of the art fingerprint scanner that can be found on the rear of this sleek Android device, you will be able to secure all your personal files while, simultaneously, it allows you to unlock your smartphone in a split second. Above the fingerprint scanner, you’ll furthermore be able to find a sophisticated 8MP camera that allows you to shoot beautiful images and HD video – perfect for capturing all those special moments in life. Taking connectivity to the next level, the THL T9 Android phone holds two SIM card slots and supports Dual-IMEI numbers – allowing you to be reachable on two different phone numbers while using just one device. 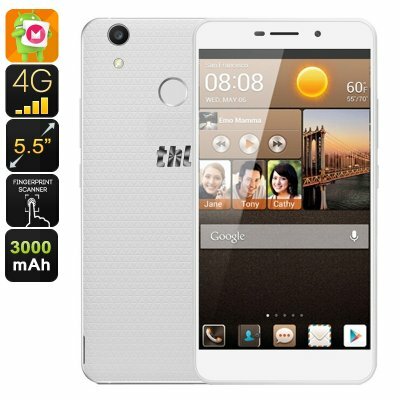 Not only does this make the THL T9 a perfect Android phone on which to separate your work and private life, it also magnificently increases your mobile connectivity as now you will be able to insert two 4G SIM cards that support different network providers. No matter where you are or where your next holiday will take you, with this Android phone in your pocket you can be assured that you’ll always be able to stay connected to your friends, family, and colleagues back home. The THL T9 Android smartphone comes with a 12 months warranty, brought to you by the leader in electronic devices as well as wholesale electronic gadgets..